What is Second Brain Psychology? 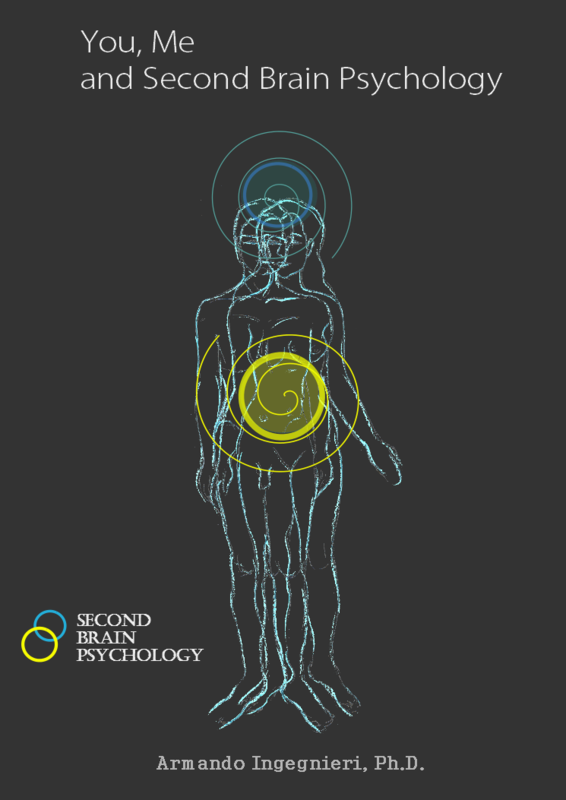 Second Brain Psychology is a new understanding of the human psyche which integrates the psycho-emotional functions of the Second Brain – the brain of the gut. These are core functions which define our personality and our way of responding to people, circumstances and events. They also define our drives and priorities thus deeply influencing the choices we make, usually at an unconscious level. The emotional mind of the Second Brain is therefore a driving force in the human psyche and behaviour. It is also the seat of the Emotional Memory, which is why the mind of the Second Brain is the focus of treatment in Second Brain Psychology. Traumatic or undigested events and emotional stress can interfere with the core functions of the mind of the Second Brain causing psychological, emotional or behavioural problems as well as psychosomatic ailments. Second Brain Psychology offers a number of solutions to these types of problems, which should be chosen on the basis of which objective needs to be reached. Treatment: In brief, treatment is indicated when the psychological, emotional or behavioural problem is deeply rooted or causing hindrance or distress. Treatment with this method is specifically aimed at the Emotional Memory of the Second Brain and takes place through interaction with the functions of the mind of the Second Brain, which has its own specific parameters and internal language. However, since the two minds work together as a whole, treatment also positively affects the functions of the mind of the head. Psycho-emotional Check-Up: Second Brain Psychology offers a unique opportunity, namely the possibility of assessing one’s psycho-emotional state by scanning the Emotional Memory of the Second Brain for hidden traumas, emotional overload or blocks. This can be particularly useful as a preventative measure against psychosomatic ailments, as well as to safeguard one’s mental and emotional well-being. 1. they provide a step-by-step understanding of the mechanisms of the emotional mind of the Second Brain and how these influence personality, outlook and relationships. These can be followed up by more in-depth workshops, or by study courses and training. Counselling: the in-depth understanding of human behaviour which Second Brain Psychology provides is of great value when applied to Counselling because it allows the Counsellor to view the Client’s problems or difficulties within the context of his or her psychological make-up. This means being able to provide the Client with effective guidelines for tapping his or her resources to the full. 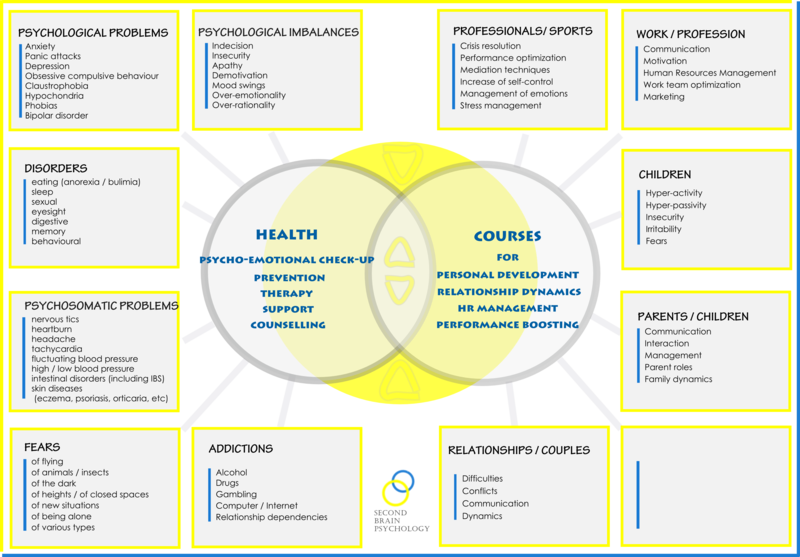 Main areas covered: relationships, family dynamics, child-management, teaching, work or study-related contexts, social interaction, self-development. These are short theme-based courses of varying sizes which deal with a topic of general interest of a specific area. The idea is to take a look at how the mind of the Second Brain works and why it plays an important role in all aspects of life. These Courses are designed to teach the basic concepts of Second Brain Psychology starting at Level 1. Some practical application is included. Further practical application can be supplied upon request in the form of one-to-one sessions or Workshops. Training Course to become certified Operator in Second Brain Psychology: a highly specialized course, which is only open to those who have already successfully completed the preliminary Courses and selection tests, is reserved for those who wish to become certified Operators or Counsellors in Second Brain Psychology thus qualifying to work as part of the official Second Brain Psychology network. Our Study Courses and our Training Courses provide valuable tools for anyone working in the field of psychology, human behaviour and communication. This cutting-edge know-how will greatly enhance any already acquired skills in these fields. The above services have a wide range of application due to the comprehensive approach and method. All Second Brain Psychology services are provided by the IC institute of psychology, or by Operators and Counsellors certified by the IC institute, of which the President and founder is Armando Ingegnieri, Ph.D, founder of Second Brain Psychology. Click on the image below, or on the IC institute tab in the menu bar at the top of the page, for further information.